In Hannah’s prayer, here, we see in verse ten that she was “greatly distressed” and she “wept bitterly” (NASB). For as it happened every year, she would come with her husband Elkanah, and with his other wife Peninah, and with Peninah’s children to sacrifice to the Lord, and Peninah, who was Hannah’s rival, would relentlessly provoke her to irritate her; for Peninah resented Hannah because Elkanah loved her more, and so, to get back at her, she would constantly remind her that the Lord had closed her womb. Hence, here we see that while they all were eating together (the meal that Elkanah had prepared from the sacrifice, verse 4), Peninah kept provoking Hannah so that she wept. Then, when she could eat no more and stay no more in Peninah’s company, she rose from the table and went into the temple to pray. There she poured out all her grief to God. Yes, being more righteous then Peninah she did not retaliate, but instead went straight to God in prayer, where she took all her troubles and found peace. Though she may have prayed over many things concerning how she felt about Peninah, etc., we know for sure what her deepest concern was; it was for a child. For we see in verse eleven that her prayer was very specific: “If You wilt…give Your maidservant a male child, then I will give him to the Lord all the days of his life…” And the Lord heard and answered her prayer (vv. 19-20). Here we see a good example of earnest, fervent prayer; for as Hannah was crying out to God in tears, she appeared to Eli as drunk. We can only speculate what Eli saw; perhaps as she expressed her sincere desire to God her body was swaying, her hands were trembling, and her tearful face was contorted. Verse thirteen tells us that as she prayed her lips moved but her voice was not heard. So we must conclude that her prayer was deeper, much deeper than words. It was a prayer of the soul and spirit, a prayer from the agony of heart break and deep sorrow. The lesson we learn here is that when we feel burdened down with sorrow and in great despair, we should go straight to the Lord in prayer as Hannah did. Just think of what would have happened if she did not go to prayer. She no doubt would have, sooner or later, had it out with Peninah and maybe even with her husband Elkanah. But the greatest tragedy would have been that she probably would not have given birth to the child Samuel—who became one of the greatest prayer warriors of all time. 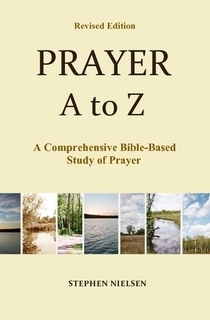 This entry was posted in Part 2, Joshua to Samuel, Prayer A to Z Excerpts, Survey of Prayer and tagged earnest prayer, elkanah, fervent prayer, Hannah's prayer, lord of hosts, prayer, Samuel. Bookmark the permalink. Thank you Stephen for sharing this story with us.I really appreciate it. needed to hear this and to be reminded to seek the Lord in prayer over certain things that I’ve been neglecting to pray about. Thank you.